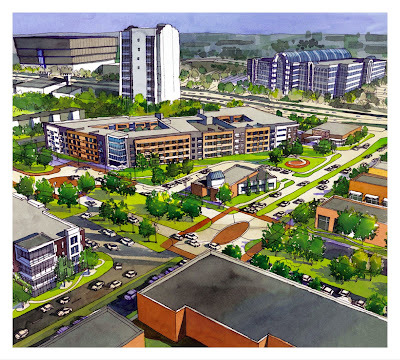 Architect's rendering of Lower Oak Lawn's first 300-unit apartment complex. Right before Christmas, I talked to developer Michael Ablon about the status of his ambitious re-urbanization project inside the Dallas Design District, which will include about 1,000 residential units. With the bad economy, I wasn't sure if his original plans were still on schedule. Ablon assures me they are, and we should see the first 300 apartments, designed by Trammel Crow Residential, open by end of January, on the corner of Hi-Line Drive and Oak Lawn. "Everything is fully funded," Ablon says, which means that the remaining two residential complexes, being designed by Atlanta-based Wood Parners, will open on schedule, by late spring. Ablon himself is spearheading an extension of the Katy Trail, which will run through the Design District, and should be complete by early summer, he says. This won't be just another overpriced Uptown enclave for rich, white professionals he assures. All the residential units are for lease, which will keep prices down and encourage a mix of more creative types. With all the new art galleries along Dragon Street, Ablon sees the area as a place for artists and art lovers to congregate. He's bringing in restaurants, but no chains are allowed. He's going for locally-owned bistros and pubs, which will make up the last phase of the Design District Development, which he's named Lower Oak Lawn. If you work inside the Design District, I'd like to know what you think about all the new development. It seems to have had a positive effect for the average Josephine, with a number of former Trade-Only showrooms opening to the public and offering retail prices. Still change is hard. I'd like to know what you think.